I have a hunch. I’ve had many over the years, some have been right, and I’ve forgotten about all the ones that were wrong, so I’ll continue. Library music (or production music) is still big business, judging by even my PRS earnings, let alone those of the numerous composers I know. And library music publishers are still commissioning new music. Yet as digital technologies evolve faster than I can play semiquavers, and everyone is acquiring multiple creative and media skills, library music is still delivered in a pretty un-mashable way. 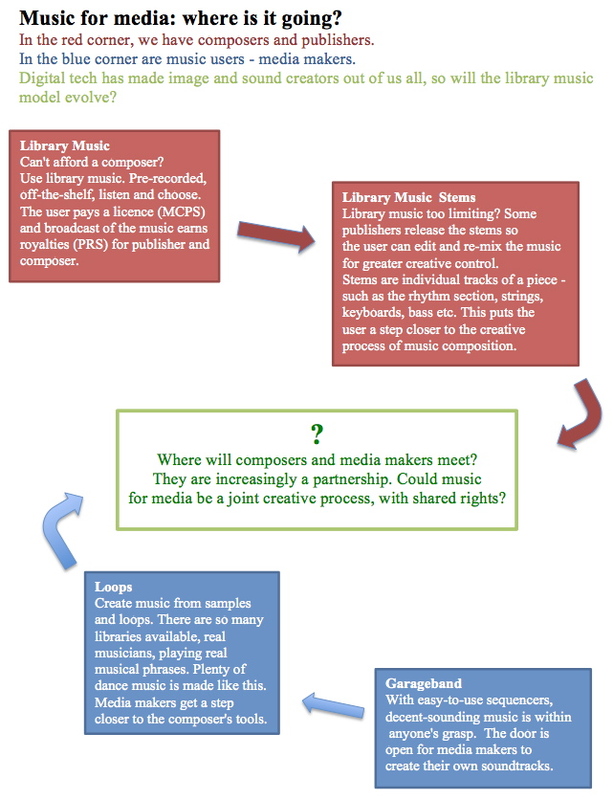 Sure, music users (I’m talking people who create and edit pretty, moving pictures mostly) are given alternate mixes, different length versions and even stem packs to remix, but couldn’t the music be more flexible, user-centred and re-writable? In contemporary art and pop music the concept is already being explored by Bjork with Biophilia – an interactive album, released as an ipad app, and Brian Eno’s app, Scape. And in library music, not surprisingly, it’s already happening too. Extreme Music are using Ujam’s songcruncher tech to offer production music you can customize in a web browser, so you don’t even need music software, though I’ve not been able to try the tech myself. Music that can be remixed (or re-constructed) needs to be written in a different way from linear music. It should be loopable and stackable, made up of individual ‘cells’ or music phrases that can interlock in a variety of ways, with minimal rhythmic and harmonic clashes. I imagine it is nigh on impossible to cover every possible mash-up of component parts but at least getting close to that ideal has to be the goal. That’s the musical challenge, the next tricky one is meta data – the key here is keywords, and ones that both have a musical and a descriptive meaning. Sometimes our vocabulary does both; ‘rising’ has a clear musical meaning and one that will make sense in a non-musical, or emotionally descriptive way. But other keywords will need expanding – ‘driving rhythm’ suggests musical devices to me, but the emotional result is explained by words such as ‘energy’, ‘movement’, ‘pushing forward’. And the challenge that will be most contentious, is the rights issue – who gets the royalties? If the user has a creative input in remixing and re-positioning the musical elements, is the end product a co-write with the composer? That’s the elephant in the room. Library music publishers and composers naturally have an interest in maintaining the status quo, but that doesn’t mean we shouldn’t face up to the question. And what happens to the current licensing model? If the user becomes a co-writer, who pays a licence fee to whom? I don’t have answers, but I don’t want to avoid questions! I’m coming at this with some history: construction kit loops packs, modular composing and an idea for an app and art installation based or user-constructed music. So my next challenge is to produce elements that can be re-positioned, layered and re-mixed by a music user in a way that warrants co-authorship, and the resultant shared rights. This entry was posted in string_arranging and tagged library music, production music, realstrings, rights, royalties. Bookmark the permalink. A comment to this post came in via email and the author wished to remain anonymous. I was interested to read your thoughts on the future of Library Music. With technology advancing the way it is, digital delivery in particular, I think it is generally felt that the whole creative process needs a more flexible and creatively based “vehicle” to carry media music into the next generation. Do you know that in the early 1990s KPM tried something like this by offering Pro Tools files to users for selected projects? Back then, it didn’t work, partly, I think because editors of that era weren’t as tech savvy as now and also because time was so expensive in facilities that no one could afford the luxury of editing Library Music. In fact, the very reason Library has done so well is largely its inherent ease and speed of use. But, I think you raise several really good points. The whole way that Library is now used has changed enormously. It is very common now for a 2 minute feature report, say, to used 20 different pieces of music in 2 or 3 second bursts, whereas years ago it would have been more common to score the whole thing with 1 track. There is a much greater “loop based” sort of mentality amongst editors, which has more to do with the way sample libraries work than composed tracks in a way. And I think music is brought in in a much more structured way that has come more out of pop video than TV, which leads inevitably to the direction you suggest. My two areas of concern would be 1. Who decides on the division of rights in a more collaborative world? and 2. Will we ie: the musicians and composers get lumbered with actually doing most of the work ourselves? It kind of points to increasing amounts of labour (for us) for ever decreasing amounts of revenue. Or is this simply inevitable anyway, given the way this has been going for a few years now? I don’t know how “au fait” you are with TV deals, but I do know of one composer who told me that the usual “coercive” deal of a 50/50 PRS split via publishing arrangements had been extended to 75/25 in the TV prod comp.’s favour, because one of the production team had “helped” to compose the music and therefore they felt that it justified 50/50 split of the writer’s share, meaning 75% to themselves! The composer had to accept it or lose the gig. I reckon we should be a bit careful about sharing too many creative rights! And yet this may be the future. Maybe the smart guys will be the ones who embrace the change and make it work to their advantage, but the caveat must surely be that rights, like money itself once given away are extremely difficult to get back again. I’m just banging the composers’ drum here a bit, I know, but I think we all need to be careful of a slippery slope “race to the bottom”. I’d be really interested to know your thoughts on the business implications of where we are heading with this. And I’ve been prompted to write this really because I think you are spot on with your analysis of the future of Library, creatively speaking. Very interesting stuff! It’s happening for real with Xhail. http://scoremusicinteractive.com/ Composers supply stems and elements to be re-purposed by the user. All parties share copyright. It’s not going to be popular with many composers who don’t want the current model to change, but that doesn’t mean it isn’t going to happen and make an impact on music for media and the future of music rights.